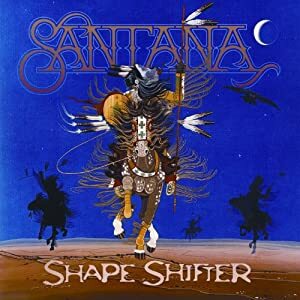 By Matt Springer“The record is basically directed to honor the American Indians,” Santana told Guitar World in February. “As you know, the people in New Zealand collectively agreed to give an apology to the Aborigines in Australia, and for me, whatever we do here in America to honor the American Indians, the Chinese, African-Americans and everybody else is a big step. So I created a CD, ‘Shape Shifter,’ and it’s dedicated to the American Indians.”Comment: Note the stereotypical Plains imagery below. I believe a Native artist created this image, but still. The concept of a Native "shape shifter" is vaguely stereotypical too. It implies Indians are especially tricky and difficult to discern, not to mention mystical and otherworldly. So the album encompasses two prime stereotypes: the Plains warrior and the supernatural "shaman." I'd be more impressed if Santana "honored" Indians some other way. Perhaps by recognizing them as a modern and diverse range of people. For more on Indians and music, see Kiowa Gordon Talks Music and Movies and Navajo Nation Band. He previously had one called Shaman. Little does he (or most people, for that matter) know that "shaman" is a snarl word used by anthropologists with an "all primitives are the same" implication. Actually, anthropologists used the word shaman in a very specific context, to a regional area in what is now Russia. Popular culture has turned the word shaman into the snarl world. Anon: "Shaman" also has such a dubious usage with an Alpha Flight Native superhero. I never heard my friend the Odawa medicine woman use it, and in fact I only ever find the word used in "distant, ignorant, and generalizing" contexts such as the anthropologists you mention, and also new-agers.